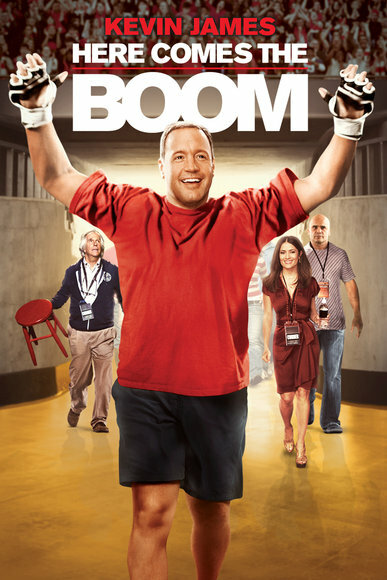 Here Comes the Boom, an uplifting story about a teacher Scott Voss (played by Kevin James) who decides to enter the world of MMA Wrestling in order to save the job of colleague and friend Marty Streb (played by Henry Winkler). Off the bat you see Voss has lost his spark for teaching and lost hope in the school system. He walks in to his classroom late, reads the newspapers, and he has basically given up on his students. We find out that over 10 years ago Voss was chosen as Teacher of the Year, but through the years his enthusiasm has diminished due to the lack of funding and interest in the school system. The story line quickly jumps in to motion after a teacher’s meeting in which the teachers are informed that there are funding cuts that will affect the music program. Marty Streb the music teacher has his heart broken as he has just found out that his wife Mollie (played by Nikki Tyler-Flynn) is now pregnant. Voss, having learned about Marty’s baby on the way, quickly jumps up in outrage to defend his good friends teaching position by trying to rally the other teachers to aide in the salvation of the music program and Marty’s job. The next day he organizes a teachers meeting to organize a fundraiser to which, no other teacher aside from the school nurse and love interest of Voss, Nurse Bella Flores (played by Salma Hayek). In an effort not to fail his friend Voss begins to teach citizenship classes to earn money on the side to raise the $48,000 needed to keep the music program going. During his teachings, Voss meets ex-MMA fighter Niko (played by Bas Rutten) who asks Voss to tutor him so that he may ace the citizenship test. While at Niko’s place, Voss watches an MMA fight and realizes that the fighter can earn plenty of money fighting even if he loses. From there the storyline ensues, Voss begins to fight in tiny MMA fights under the coaching of Niko and as the title states, he brings the Boom, or shall the boom gets him. In his initial fight Voss is literally knocked out within seconds. To care for his wounds he goes to Nurse Flores and she learns of his plan to fight his way to the $48,000. The film continues with Voss fighting minor MMA matches with Marty and Niko in his corner and quickly he begins to earn a little notoriety within the MMA circuit. Eventually Voss gains confidence and in the process rekindles his spark for teaching now that his students see him as a hero. Voss’s plan to fight for the money becomes an inspirational story with little many little moral lessons intertwined about following your dreams, being passionate about what you do, and never giving up. Eventually Voss gets recognized by real life UFC Commentator Joe Rogan and is asked to participate in the next UFC fight happening in Vegas where he can win up to $10,000 just for losing a fight. At this point they have earned almost all the money needed to keep the music program alive and only need to lose this fight to reach their goal. As luck would have it, while celebrating a day before the match in Vegas, Ms. Flores contacts Voss and informs him of the money laundering by Assistant Principle Elkins (played by Mookie Barker), which has taken all the money they have earned thus far. After learning the horrible news, Voss vows to go in to the ring, not to lose the fight, rather to win it all for the $50,000 prize which would salvage the entire reason for his stint in to the world of MMA fighting. From there the movie well as can be predicted takes on a Disney-esque happily ever after tone, with Voss making his intro to the arena with the entire music program instrumentally playing his fight song, Nurse Flores cheering on Voss, and his entire school watching the fight from the school gymnasium. The film ensues with Voss taking on UFC fighter Mark Dellagrotte and after two-rounds of getting pounded on Voss finds the strength inside of to bring the “Boom” ending the fight victoriously with a knockout. Is this plausible, no, the likelihood of a middle-aged man deciding to take up MMA and ultimately make it to a UFC fight within a few short months beating a known fighter is highly skeptical- who cares? 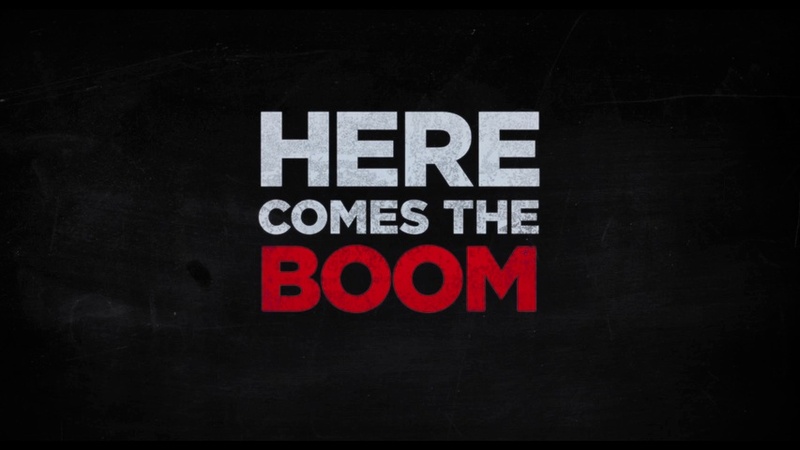 Here Comes the Boom is a light-hearted feel good film, perfect for the whole family to watch filled with slapstick comedy, moral lessons, and a little romance. I say- GO SEE IT.